We have all seen the advertisments for lamps produced for the Sportsman done in a fishing theme. Using old reels, wicker baskets and other fishing items usually produced to look old and from by gone days. 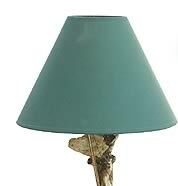 What most people are unaware of is that the majority of these lamps are produced in cast poly-resin and mass produced. The lamps offered by FEATHER RIVER ANGLER'S WORKSHOP are all made of actual antique fishing components. Many use old antique bamboo rods and none of the components are reproduced. Because of this, you may rest assured that each and every lamp is an original and there is not another to be found that is like it. Another approach is to construct lamps from parts that you have in your possession. 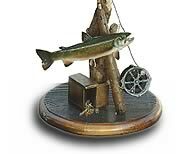 Many people have old rods, reels, baskets or lures left to them by fathers and grandfathers that are unusable for fishing but are things we just can't part with and with good reason. The only problem is that these items are either stored in the attic, garage, a closet or in some cases hung so high on the den walls, most people never see their craftsmanship and beauty. Lamps can also be used to display that special rainbow you caught last year using one of our professionally done Fish Reproductions. These items can all be used in building that very special lamp. One that is not just a conversation piece, but a piece of a very important story as well. -click below for close-ups-!